One of the biggest video game announcements of the year has no doubt been Far Cry New Dawn, which was revealed at this year’s Game Awards show. This is another entry in Ubisoft’s long-running Far Cry series, the first game of which was released in 2004 (that was a Crytek effort by the way – the later Far Cry games were made in-house by Ubisoft). Something that’s immediately striking about the upcoming Far Cry New Dawn is its setting. While most Far Cry games have taken place in the present day, New Dawn is set in a post-apocalyptic future America. This is the series most original setting since 2016’s Far Cry Primal rewound the clock to the Stone Age and Far Cry 3: Blood Dragon presented us with a sci-fi setting (featuring laser guns and mechanical dragons to boot), causing a sensation back in 2013. And now the series is headed to the post-apocalypse with Far Cry New Dawn, something Ubisoft’s team at Ubisoft Montreal is enthusiastic about as art director Isaac Papismado told GameSpot in an interview. “It’s something that really excites us. And this is an opportunity for us to really do the Far Cry take. We really want to have something that’s unique and refreshing for the player. Everybody has their own opinions and ideas of what a post-apocalyptic setting should look like, but we really wanted to bring the player somewhere that’s really refreshing for him”, Papismado told GameSpot. And while you would expect Far Cry New Dawn’s post-apocalyptic world to be a barren wasteland after the bombs fell at the end of Far Cry 5 (this year’s big Far Cry game, to which New Dawn is a direct sequel), this isn’t actually the case. 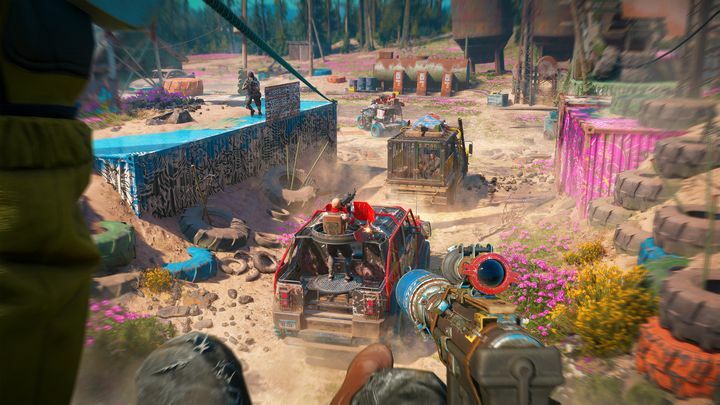 Far Cry New Dawn’s post-apocalypse is colourful and lush, thanks to the “Super Bloom” effect that Ubisoft researchers have found out could occur in the wake of a nuclear apocalypse. Despite the world being bright and colourful though, there’s still plenty of violence in it. This is because there are two warring factions fighting for power in Far Cry New Dawn: the Survivors and the Highwaymen. As is tradition in the Far Cry games, you play an outsider – a random survivor from outside the game’s Montana setting. Far Cry New Dawn also looks likely to have a colourful villain as in earlier Far Cry games. Two villains, actually – Mickey and Lou are the leaders of the Highwaymen, and you’ll have to take them down throughout the course of the game. This likely won’t be an easy task, as the twin sisters are as ruthless as earlier Far Cry villains such as the crazy pirate Vaas from Far Cry 3 and dictator Pagan Min of Far Cry 4, having murdered their own father to take control of the Highwaymen. “It was a world of scarcity and lawlessness, and any good villain always think that they’re doing the right thing and that’s exactly the case with twins. They’re here for a good time, not a long time. The Survivor philosophy is to plan for tomorrow. These guys live for today”, said Ubisoft’s scriptwriter Olivia Alexander. As in earlier games, assaulting outposts will be a key part of Far Cry New Dawn’s gameplay. Also, those who played Far Cry 5 to the end will be wondering what happened to Joseph Seed, the villain of that game. 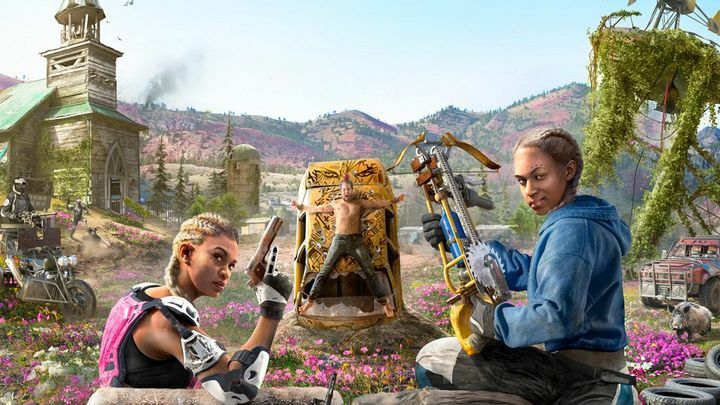 A Far Cry New Dawn preview video shown at the Game Awards earlier this month revealed he’s still alive, although what part he plays in New Dawn’s story is still a mystery. Other Far Cry 5 characters like Pastor Jerome Jeffries will be returning in Far Cry New Dawn though, their role in the story is unknown at this point too. Aside from the new characters and setting, also interesting are the game’s new Expeditions. These are missions which take you to new locations outside of the game’s Hope County, such as a beached aircraft carrier in the West Coast and the Colorado Canyon, and which can be played cooperatively. Expeditions could certainly be interesting for those who get tired of roaming about Far Cry New Dawn’s map taking part in open world activities such as raiding outposts, a hallmark of the series to date. Regarding outposts, one interesting new aspect of the game is the fact that once taken, outposts can be abandoned. These will be reclaimed by the Highwaymen, and will be tougher to retake from then on, encouraging you to team up with other players or one of Far Cry New Dawn’s NPC to do this. Speaking of NPCs, while fan-favourite Boomer is gone, there’s another dog in the game named Timber who can accompany you on missions, while a bear named Horatio can be your sidekick too. In conclusion, Far Cry New Dawn’s post-apocalyptic world sure looks cool, and could be a breath of fresh air after Fallout 76 failed to impress this year. It would be a great thing then, if Far Cry New Dawn turned out to be another great entry in the franchise, something we’ll find out when this hits shelves early next year. Note: Far Cry New Dawn will be released on February 15, 2019. Available on PS4, Xbox One and PC.